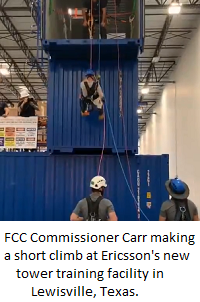 FCC Commissioner Brendan Carr was busy last week in Texas. Before he addressed attendees and met with Inside Towers at NATE Unite 2019, Carr toured local industry manufacturers such as CommScope’s plant in Euless, Texas. In this short video, Carr sees workers welding and galvanizing steel and aluminum into next-gen infrastructure. Carr then went to Ericsson’s new tower training facility in Lewisville, Texas. U.S. Rep. Michael C. Burgess, M.D., joined the group. Carr gave short remarks at the facility before climbing. Devin, a former combat engineer, showed the Commissioner the ropes as he performed his first simulated rooftop descent. Carr’s heard from tower crews across the country that they’re facing a shortage of skilled workers needed to deploy networks, due to the broadcast repack and race to 5G. Carr said training facilities like these are essential to building a robust pipeline of workers to fill 5G jobs. The next day, Carr headed to Sheman, Texas, to visit a CableONE fiber deployment. High-speed connections are being deployed to this growing rural community to connect homes and businesses. Crew members Andy and Luis let the Commissioner try his hand at the boring machine. Check out this short video. He then headed to Dallas for a visit to the FCC field office. Carr rode in a truck with the crew to see how they pinpoint spectrum interference issues. Then he headed to Samsung’s facility in Richardson to see radios and small cells coming to market.